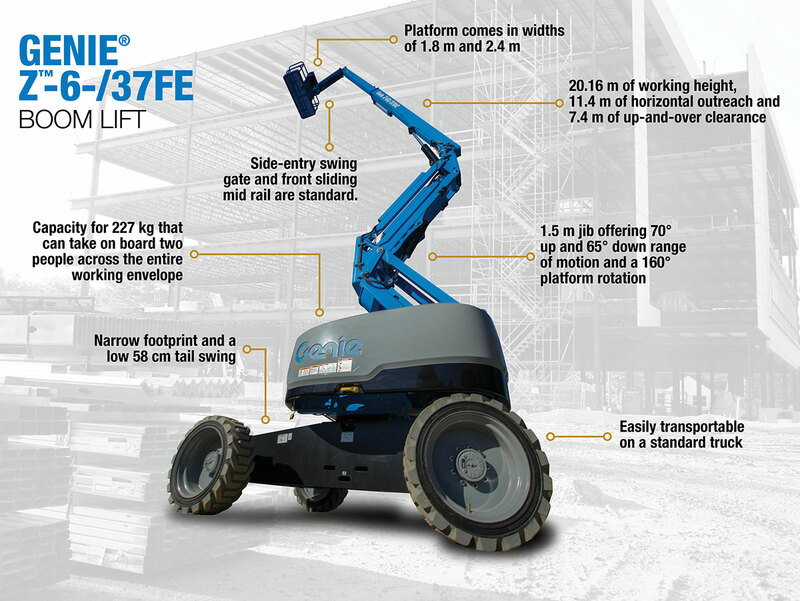 The new Genie® Z™-60/37 fuel electric hybrid (FE) boom lifts is a 4-wheel drive, and can climb 25% faster than typical diesel powered units. With up to 45% gradeability and all-terrain foam filled tyres standard, you will be ready for anything – indoors or outdoors. Please contact your local Sales Manager or phone 1800 788 633 to find out more about this product. 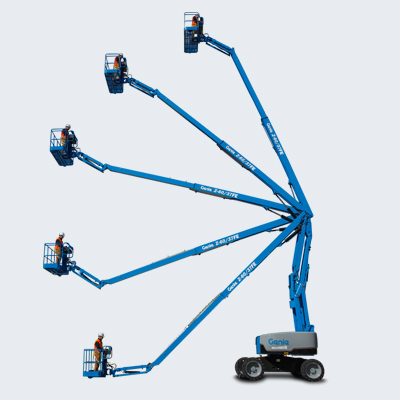 The Genie® Z™-60/37FE lift is equipped with a dual parallel link design so you can track up and down a building by just raising or lowering your secondary boom. 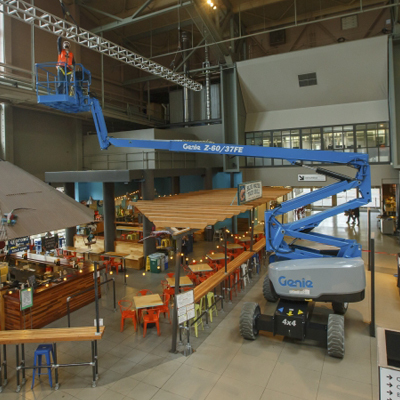 Another benefit is the Genie FastMast™ system, a productivity feature that enables the boom lift to be moved from full height to below grade, and from below grade to full height with the secondary boom fully raised. With the secondary fully elevated, your primary boom can go all the way to the ground and then back to full height with one function. This is the fastest way to and from 18.29 m (60 ft) for operators who need to go down to grab materials frequently. Don’t underestimate the capability of the Z-60/37FE machine: A rugged 4-wheel drive machine with fully sealed AC drive motors that can still perform while submerged under water. It is also able to go 25% faster and climb slopes better than typical diesel powered units. The new Genie® Z™-60/37FE shares the same oscillating axle system as our Genie® Z™-62/40 and Genie® S™-60 family of boom lifts, so from a drive system standpoint, it will perform very similar to our other rough terrain machines. These ‘go anywhere’ capabilities are why we gave the Z-60/37FE model all-terrain foam filled tyres. The FE model features non-marking tyres as standard for those interior applications. The Genie brand is known for products that are service-friendly, and these new booms are no different. Due to parts and controls commonality, your service team can get in and finish tasks quickly and stock less to save time and money. 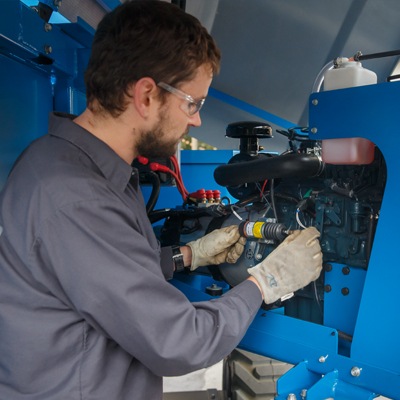 Swing-out trays and ground control panels bring components within easy reach and service efficiency in mind. The 1.83 m (6 ft) or 2.44 m (8 ft) platforms, with a capacity of 227 kg (500 lbs) enable two people to access the entire working envelope. The 2.44 m platform comes with an additional side sliding mid rail, opposite the standard swing gate, for a total of three entry points. In addition, the 1.52 m (5 ft) jib provides a high range of motion, 70° up and 65° down. Couple that with 160° of platform rotation, and you really have a lot of refined positioning power at the boom tip. It also boasts a narrow footprint and a low 0.58 m (23 in) tail swing, ideal for working in confined environments. The new Z-60/37FE boom lift provides the choice of two modes of operation. In ‘hybrid’ mode, the machine uses its environmentally-friendly 24-hp Tier 4 Final /Stage IIIB engine-powered generator to maintain the battery state of charge or to supplement the battery power to get a boost in machine performance. To keep productivity high and maintenance costs low, its engine-powered generator constantly monitors the battery state, keeping them topped off for maximum run time, then automatically shutting off to minimise fuel consumption. For extreme usage conditions or after heavy full-electric operation, the high power hybrid system can provide a bulk charge within approximately 4 hours. The hybrid system is powerful enough: - to simultaneously charge the batteries and allow boom and drive operation, - to provide power directly to the four wheel AC drive motors, allowing the system to combine the diesel driven generator and the 48V DC battery pack, maximising performance when climbing hills and taking on the most rugged terrain. 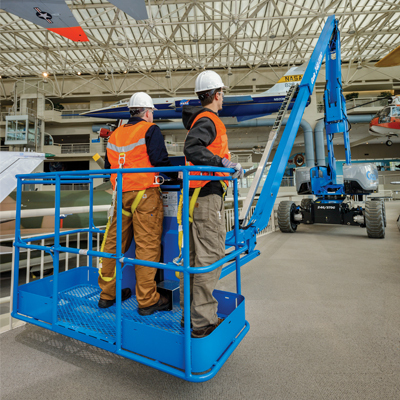 Thanks to a quiet, low emissions design, the Genie® Z™-60/37FE boom lift is a great asset for malls, construction sites, sport arenas, manufacturing plants, and even challenging pedestrian areas with the demand for low noise and clean performance. You will love the low emissions and full workday performance on one charge. 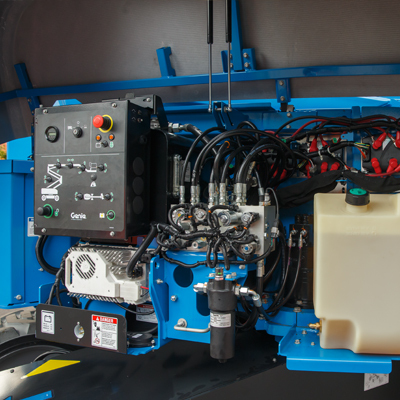 The Fuel Electric Hybrid system (two machines in one package) gives environmental consciousness, lower cost of operation and the opportunity to increase your rental ROIC.